The eighteen of us, mostly strangers, from the Chennai Trekking Club, were on a three- day forest camping and hiking trip and Nature Workshop at Kālinga Center for Rainforest Ecology (KCRE) in Agumbe, Karnataka in the mountains of the Western Ghats. 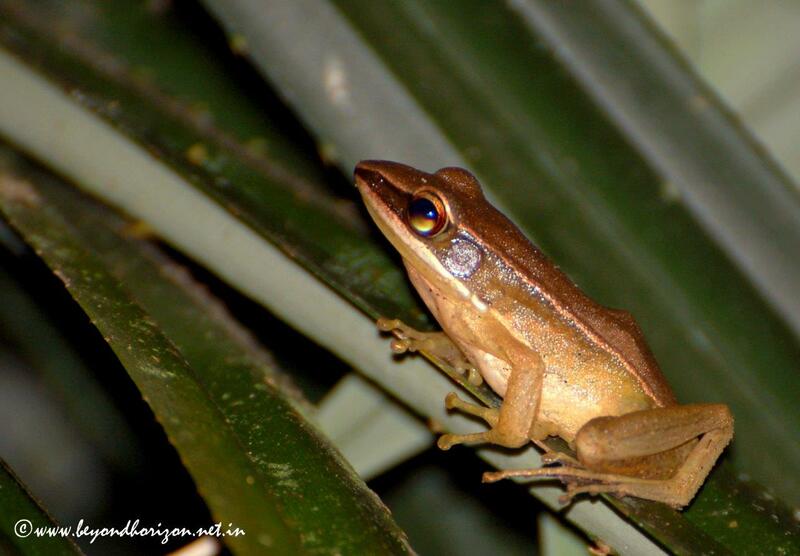 KCRE is founded and run by Mr Gowri Shankar, one of the leading herpetologists of India. He is said to have rescued more than 200 king cobras, the largest venomous snake. 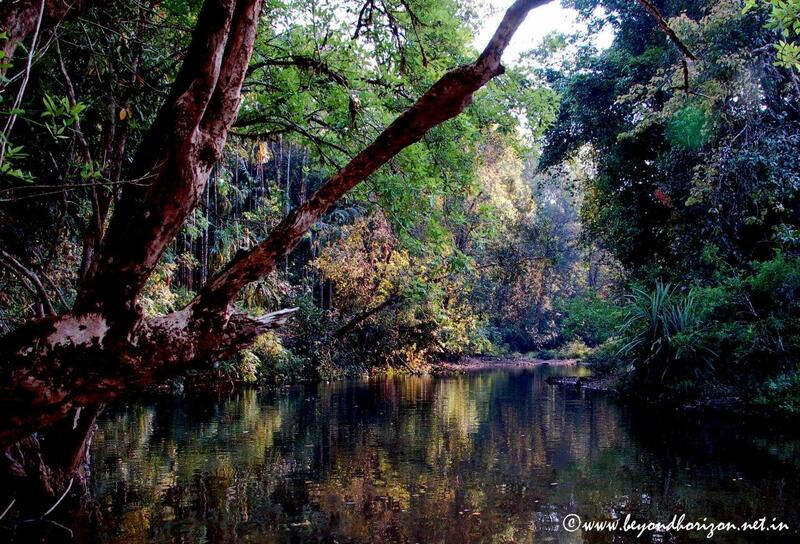 Agumbe, with about 7000 mm of rainfall in a year, is one of the wettest places in India, and has a very rich bio-diversity. We arrived at a camp in the jungle early in the morning and the first look was exciting. It was end-March and the weather was comfortable. The camp, located within an areca nut cultivation, was surrounded by thick forest. A small stream flowed along one side – after the rains it would be swollen and forceful. 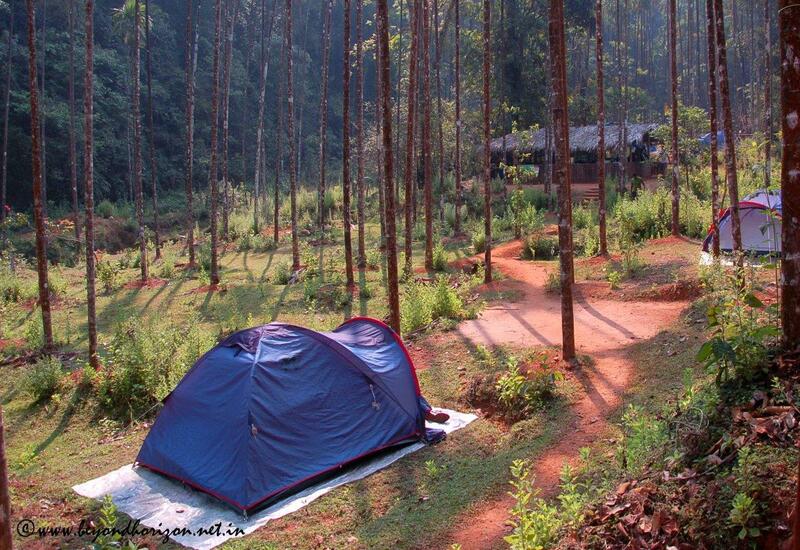 Small clusters of tents were pitched across the camp blending in with surrounding forests. A large arena in the centre, with a thatched roof, was used for dining and meeting with people. It also housed a small library and a baggage storage area. In this camp you could touch nature and everyone was eager to discover it. Soon after a cup of hot coffee and a tasty breakfast, Gowri briefed us about do’s and don’ts of the camp and the way of life there. There is no electricity or internet connection and mobile phones don’t work there. Dining and toilet areas are lit up using batteries during the evening and the camp retires by 10 PM. 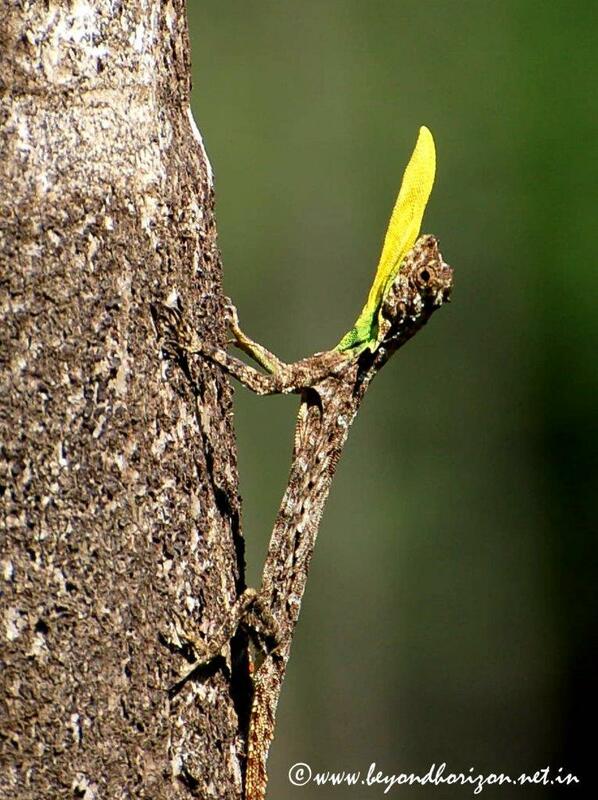 Our first discovery was an amazing flying lizard, draco (Draco dussumieri). 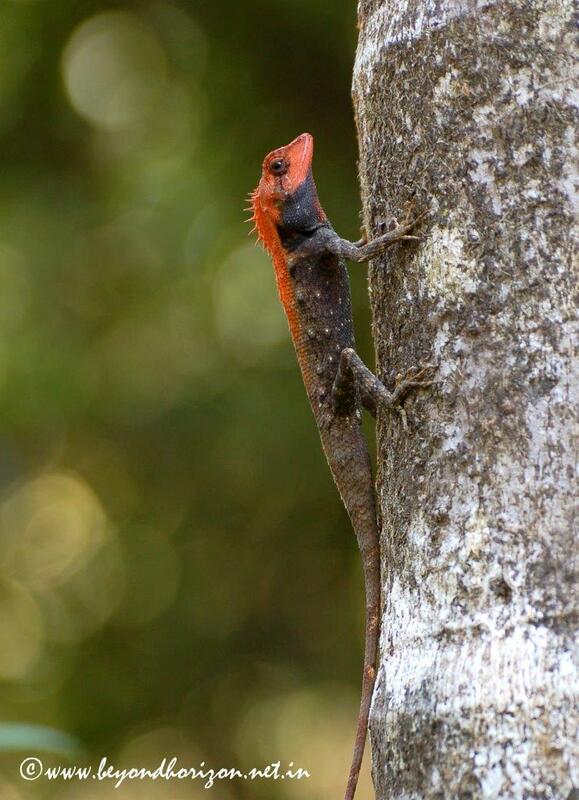 There were quite a few of them, climbing the tall areca nut trees in the camp. As they climbed, they flared their dewlap, a bright yellow skin below the neck, to impress or frighten another draco climbing up a nearby tree. When they approach the top, they spread their ‘wing’, a thin skin attached to the sides of their body and then jump from there, gliding several meters to another tree, showing off their colorful underbelly. It was absolutely thrilling to witness this. After observing the dracos and the beautiful birds around the camp for a while, it was time for a jungle walk. Led by Sonu, an Intern researching on snakes, we followed a trail inside the forest along a small stream, to discover nature. There were many colourful butterflies, dragonflies and damselflies, particularly near the water and also some beautiful lizards. The rainforest is also home to a wide variety of trees and climbers. Orchids sprouted on branches and fig trees strangulated tall trees. The figs, when big enough, would eventually kill the supporting tree itself. Back to the camp, tired and hungry, we were treated to a delicious hot lunch – rice and curries, local delicacies from the Malnad region of Karnataka. 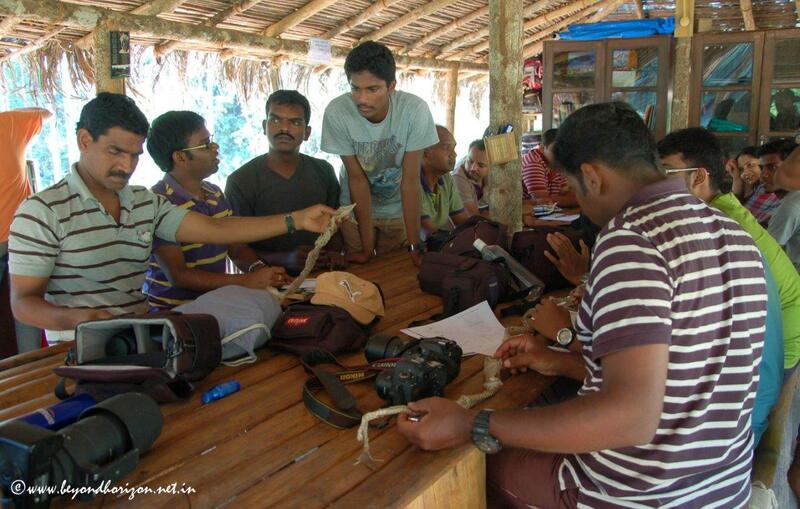 In the afternoon, it was time for Gowri’s snake workshop. From shed snake skins we learnt how to identify species by counting the scales and observing their patterns. We lazed around the camp for a while before heading to a forest pool. After a 30 minutes’ walk, we arrived at a pretty pool fed by a small stream. The ambiance was mesmerizing. The pool was surrounded by dark evergreen trees, their shadows reflected on the water. Some jumped into the water right away, frolicking around to their heart’s content. But sitting at the edge of the pool taking in the beauty of the lake and listening to the numerous birds’ calls was also very satisfying – it filled my soul with happiness. The dining area was the center of all action in the camp. In between the hikes in the forest, or whenever we found time, we would huddle there for a chat and some laughter. Gowri, Sonu and Ashwini – a researcher studying dragonflies and damselflies- often joined us to share their experiences about the flora and fauna in Agumbe. It was late in the afternoon and as the sun started tilting to the west, we hiked up the jungle road for a few miles to reach a small hill with a panoramic view. A dark green canopy covered everything around us. Evening was approaching and the hills were slowly falling silent. Soon the sun turned bright orange and was hidden by the hill, painting the sky in many hues of orange, red and yellow. It was almost dark when we arrived back at the camp. The long walks in the forest were always filled with interesting conversations with fellow hikers, getting to know each other and setting the foundation of new friendships. A dinner of scrumptious chicken curry, rice and roti was served by 8:30 PM. Interns at the camp joined in to prepare dinner and we helped by washing our plates after every meal. These little displays of care made everyone feel part of a family there. After dinner was one of the most exciting parts of this trip – a night-walk through the rainforest. Armed with torches, we looked carefully for snakes and other animals. There was an eerie feeling as we walked quietly, in single file, leaving the camp behind. 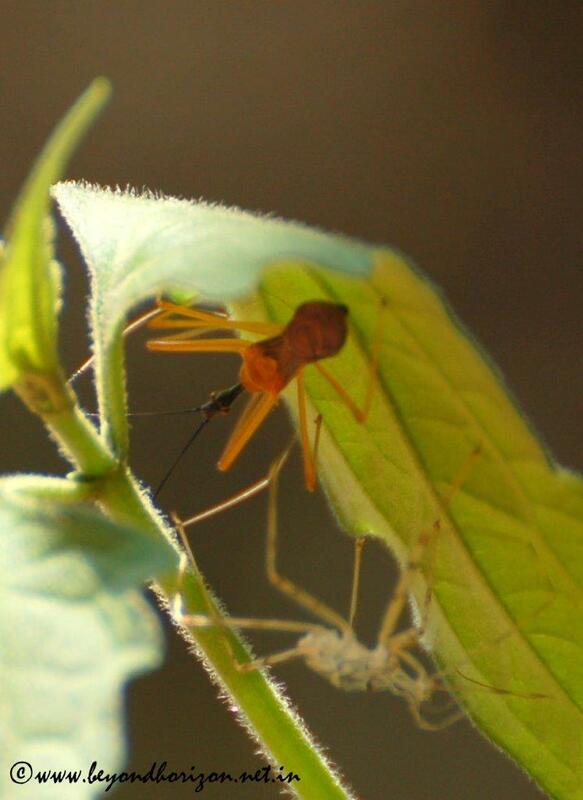 The thought of something watching me from a few meters away, even though I couldn’t see it, sent a chill down my spine. We heard nocturnal birds calling as we walked slowly, scanning every inch around us. Suddenly, someone spotted a snake on a tree. Immediately all of us gathered there, training our torches. It was less than a meter long, lying on a small branch, probably hunting for a pray. 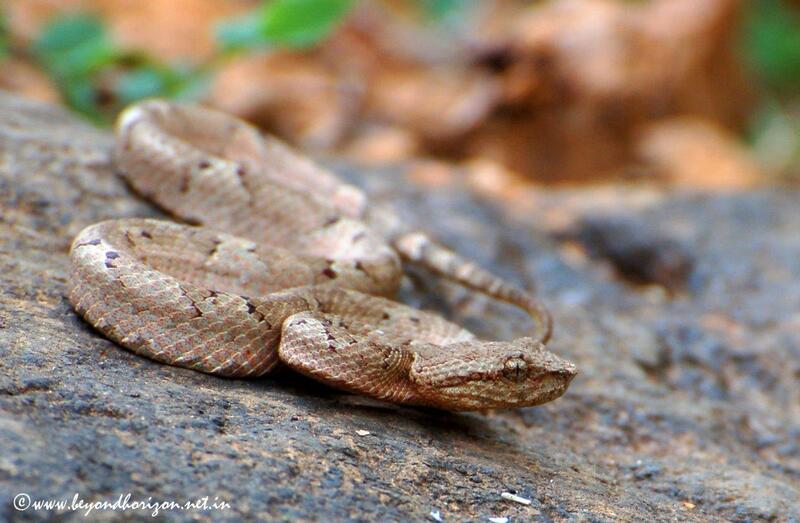 Gowri said that it appeared to be a Malabar Pit Viper. It was really exciting to spot a venomous snake in its natural habitat – our day was made. The next morning I woke up to the long and melodious call of a Malabar Whistling Thrush. There was a cacophony of calls of many other birds coming from the trees around the camp, but the long call of the thrush was unmistakable, containing many notes and varying pitches like a song. There were two thrushes calling alternatively. As I came out of the tent, I felt the slight chill of the morning. I took a short walk out of the camp. The sun was yet to come out on to the valley. It was misty, and lively with bird calls and the omnipresent noise of cicadas and crickets, as I smelt the chilled forest air. The camp started buzzing again as everyone got up and gathered under the thatched roof. Over breakfast, we fervently discussed the first night’s experience. The morning was spent hiking through the forest. Learning how to set up a camera trap and operate it was exciting. We saw how the trees in the forest fight for their share of sunlight and when a large tree falls, how its space gets occupied by other trees. 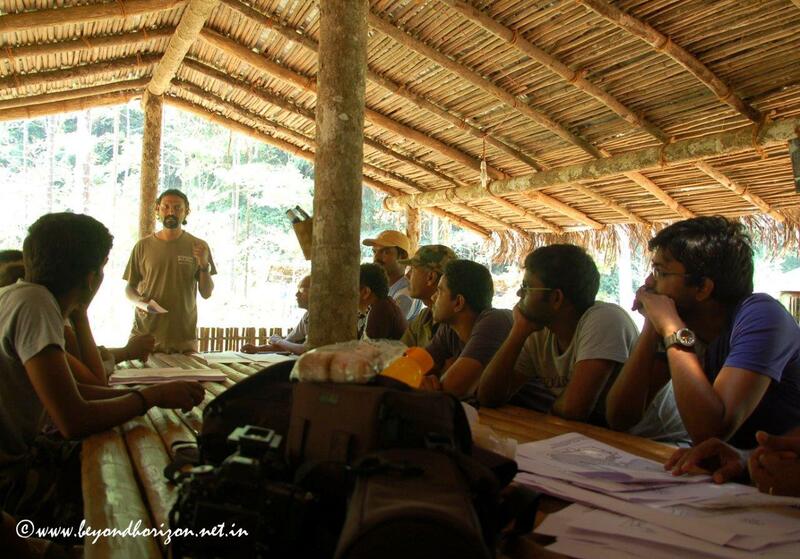 Later in the day, Gowri conducted a workshop on tigers and their conservation. There were so many species of tigers in the past, but some have become extinct and many countries have lost their entire tiger population. Sessions with Gowri were always fun, as we digressed to ask him questions about nature. And he answered all our questions, sometimes with a funny twist. In the evening, taking advantage of the clear sky, we had a long session of star gazing. With the help from the more knowledgeable among us, we spotted the planets, stars and constellations shining above us. It was fun to be able to identify directions in the complete darkness just by looking at the sky. After dinner, we took a walk around the camp. After scrutinizing every bit of the ground, we spotted some colourful toads and insects. On the third morning, I got up again to the call of the thrush, dressed quickly and joined a few others to hike to a nearby hill to see the sunrise. The trail was covered with small rocks and gravel. It was easy to skid or topple if we were not careful. As I climbed up, the eastern sky was getting brighter. Below us I could see the rolling hills, with the valleys covered in mist, almost till the horizon, the ridges and peaks peeping out through the mist like the crests of waves. The sun came up from behind the hill like a ball of fire, covering the sky with a mild tinge of orangish red. Except the chirping of birds, the entire hill was silent. 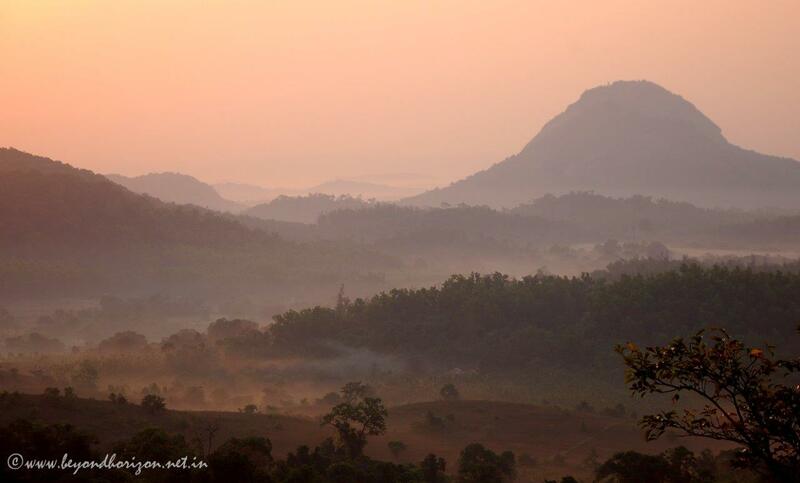 The rays of the sun slowly filled the valleys, passing through the mist and painting them orange. We stood there awestruck at the beauty that was slowly unfolding. It was an intimate encounter with nature. We sat there for a while, enjoying the moment, and talking about life and happiness. Our individual perspectives were changing. We walked back to the camp as the sun got warmer. After lunch, it was time to pack up and leave the camp. We had spent three wonderful days in nature’s lap and in the company of some wonderful people. All of us hoped to come back again to hear more snake stories and jungle lore. As we bid goodbye to each other, there was a tinge of sadness, a feeling as if we had known each other for a long time. May be we are truly ourselves only when we go back to nature and live as part of it, realize how small we are in the scheme of the things, respect each other for what we are and help with whatever we can. That is when we become humane. May be we will all meet another day, in another forest, to celebrate life.